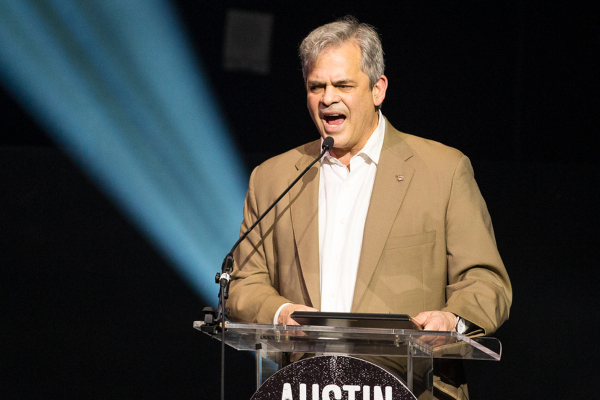 By W. Gardner Selby on Wednesday, May 16th, 2018 at 1:20 p.m.
Austin Mayor Steve Adler, shown here at a Feb. 28, 2018 celebration, made a jobs-gained claim about Austin that rated False on the PolitiFact Texas Truth-O-Meter (NICK WAGNER, Austin American-Statesman). Some background: We recently found accurate an Adler tout of Austin’s jobless rate. From January through March 2018, Austin’s unemployment rate ran shy of 3 percent; the rate had mostly stayed under 3 percent since the start of 2017. So, we wondered, is Austin flat-out growing more jobs than any other city in the country? The Austin area was home to 1,060,200 jobs in March 2018, the chart says, and that count was up 36,800 jobs, or 3.6 percent, from March 2017. Listed as metro areas with the next-most percentage gains: Orlando (3.5 percent); Phoenix, Seattle and Riverside, Calif. (3.2 percent each); Jacksonville and Dallas (3.1 percent each). We noticed, though, that the Austin area ranked sixth among the selected regions in raw jobs gained. According to the chart, the Dallas area had 78,400 more jobs in March 2018 than in March 2017; the Phoenix area had 65,600 more jobs than before; the Seattle area had 53,200 more jobs than before; the Riverside area had 45,900 more jobs than before; and the Orlando area had 43,700 more jobs than before. To our inquiry, a chamber expert, Beverly Kerr, pointed out the chamber’s April 2018 web post showing Austin’s No. 1 rank. Kerr also commented: "The mayor might better have said Austin is creating jobs faster than any other major metro, rather than creating more jobs, since some slower growing much larger metros are bound to actually be creating a larger number of jobs." We sought to look over the figures. So Kerr emailed us what she described as her full fetch of job changes within 426 U.S. metro areas for the selected months, enabling us to conduct our own shake-outs. We sorted all the figures by percentage gains in jobs--finding that Austin’s 3.6 percent growth placed the area in a national tie with the Idaho metros of Idaho Falls and Pocatello and behind 28 similarly less populous areas, including three in Texas. From March 2017 to March 2018, the Midland area saw a nationally leading 9.9 percent bump, gaining 8,900 jobs; the adjoining Odessa area had a gain of 6.6 percent, 4,700 jobs; and the College Station-Bryan area saw an increase of 4.3 percent with 5,100 jobs gained, the figures indicate. We also sorted the provided figures by limiting our focus to the nation’s 49 metro areas that were home to 1 million jobs or more in March 2017. Among those areas, the Austin area’s 3.6 percent growth rate as of March 2018 placed it No. 1, we found, though 14 other areas recorded greater raw job gains. Next, we queried the BLS directly about the mayor’s claim and backup information. By email, Dallas-based economist Cheryl Abbot confirmed that the figures behind Adler’s claim were rooted in the bureau’s supplemental table posted online gauging over-the-year job changes from March 2017 to March 2018 in total nonfarm employment in metro areas with a population of 1 million residents or more as of 2010. Among the 51 areas clearing the declared population hurdle, Abbot wrote, the Austin area ranked No. 1 in percentage job growth. "And even on a net change basis, Austin ranked 11th on our table (jobs up by 36,800), competing with the likes of NYC, LA, DFW, and Atlanta, among others," Abbot said. We also consulted Aaron M. Renn, an economist with the Manhattan Institute for Policy Research. Asked to provide a long perspective on the Austin area’s job gains, Renn emailed us a chart based on BLS figures showing that the Austin area topped 52 other metro areas--leaving out many--with a 51 percent uptick in nonfarm jobs from 2000 to 2017; California’s Riverside area placed second with a 46 percent increase. But among the selected metro areas, the Austin area’s raw gain of nearly 350,000 jobs over those years placed the area 10th nationally behind the metro areas of New York, Dallas-Fort Worth-Arlington, Houston, Washington, D.C., Los Angeles, Miami, Riverside, Phoenix and Atlanta, according to the chart. Published: Wednesday, May 16th, 2018 at 1:20 p.m.